Each league had its second highest monthly OPS. The numbers for each league are in the table below. 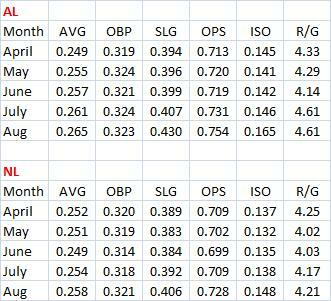 The NL's scoring was not that great but the AL had its best month. Did Branch Rickey Subscribe To The Same S**t As Billy Beane And Bill James? I am reposting this entry from April 2010 since the Moneyball movie just came out. Has Mariano Rivera statistically separated himself from his peers? That is the issue raised by an article in yesterday's NY Times Mr. Young, Mr. Ryan, Mr. Rivera Will Be Joining You By DAVE ANDERSON. He compares Rivera to Cy Young and Nolan Ryan. Young won 511 games and the next highest is Walter Johnson at 417. Ryan struck out 5,714 batters, 839 more than Randy Johnson. Does Rivera dominate his peers in a similar way? It is hard to argue against his 0.71 ERA in 139 post-season IP. I doubt any other closer can come close to that. Probably no other has had a chance to pitch so much in the playoffs. But the article offered no comparisons. No other pitcher's post-season performance was discussed. Rivera now has 603 saves and the only other guy with 500+ saves is Trevor Hoffman with 601. 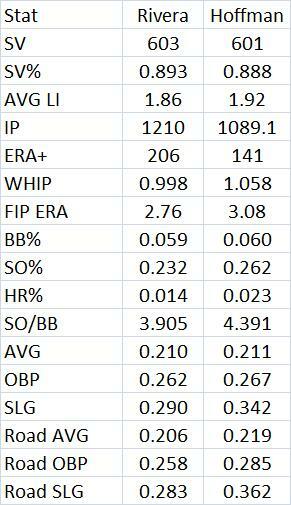 So let's see how those two compare in their regular season stats (Hoffman only had 13 post-season IP). The table below summarizes some of their stats. Their save percentages are almost identical. I thought that maybe Rivera got into tougher situations because he has such low HR% and his ERA is so much better than Hoffman's (2.22 vs. 2.87) that it seemed like maybe he came in when the score was closer. But they each have about the same average leverage index. The 1.92 for Hoffman, for example, indicates that his typical game had nearly twice the pressure as average in terms of inning and score. So these two guys pitched a similar number of innings under the same pressure and were equally successful in what they were asked to do. Now maybe Rivera was in more pennant races or playoff chases but the Yankees usually made it in fairly easily. Maybe the competition was a little tougher in the AL. ERA+ is adjusted for league average and park effects. 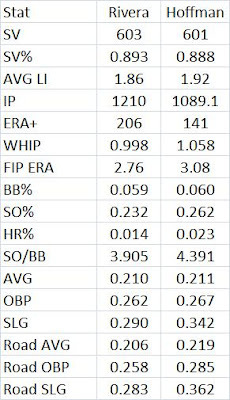 Rivera's means that his ERA so adjusted is a little less than half the league average while Hoffman is about 30% lower. So big edge for Rivera (another closer, Billy Wagner, in about 900 IP had a 187, not too far from Rivera). Wagner had a career save % of 86%. They are close in WHIP. FIP or fielding independent ERA takes walks, HBP, SO, and HR into account (with IBBs taken out). Hoffman is not too far off. This comes from Fangraphs and I don't think it is park adjusted. A rough estimate is that Hoffman's parks were about 7.2% better than average for pitchers while for Rivera just about average. If I raised Hoffman's FIP ERA by half of that 7.2% I get 3.19. When I do walk% and SO/BB ratio, IBBs are taken out and HBP are in. IBBs are also taken out when doing HR%. This edge for Rivera seems very large. Maybe it is even bigger being a righty in Yankee Stadium and other teams would have tended to send lefties up to face him. Rivera is not too far ahead of Hoffman in AVG and OBP allowed. But the edge in SLG seems big, probably due to the low HR%. The edge is even bigger in road games. One other closer, Dennis Eckersley is worth looking at. I found his best 6 seasons in FIP ERA and the simple average of them was 2.13. For Rivera it was 2.15. If I park adjust Eckersley here, he goes up to 2.19. Still not too far from Rivera. But that has to be adjusted for the league average. Those years for Eck around 1987-93. It looks like the league average has been about .44 higher in those years than it was over Rivera's years. Rivera's FIP ERA is about .474 of the league average while for Eck it is .535. If Eck pitched in those years of Rivera he would get 2.42. Not too far off (also recall that for Rivera, those are his best six years and but I just used his entire career as an approximation). Eckersely came to the closer well after the age of 30 (and maybe before that we did not really have closers). Eckersley had a career save % of 85%. What is probably the amazing thing is for how long Rivera has been consistently great. He is almost 42 and is having another outstanding season. Update: David Pinto points out that Rivera had 116 "long saves" (4 outs or more) while Hoffman only had 55. I left a response. Cage match. Who would win? I think Bill James would have the size advantage, but I really don't know for sure. Anyway, Nobel prize winning physicist Richard Feynman said “Science is the belief in the ignorance of the experts.” If that is true, then I think Bill James must be a great scientist. I thought of this watching "Moneyball" today. It was good to see them mention James and show his picture. It is very entertaining, enough so that, in my opinion, people with just a passing knowledge of baseball can enjoy it. I don't have anything insightful to say about it. Joe Posnanski has written two great articles. He gives the movie 3 stars out of 5. I think it is at least a 4. So far on IMDB it has an 8.0 rating out of 10. But that is in only 729 votes. It will probably come down, but my guess is that it will end up with at least a 7.0. Update 9-25: The IMDB rating is now at 8.2 with 1395 votes. Update 9-26: The IMDB rating is now at 8.3 with 2212 votes. Update 9-27: The IMDB rating is now at 8.3 with 2898 votes. Update 9-30: The IMDB rating is now at 8.2 with 3599 votes. Update 10-1: The IMDB rating is now at 8.2 with 3845 votes. Update 10-2: The IMDB rating is now at 8.2 with 4382 votes. Update 10-10: The IMDB rating is now at 8.2 with 6113 votes. Click here to see all of the pitchers who won the triple crown at Baseball Almanac. Only twice has a pitcher in both leagues won the pitching triple crown in the same year. 1918, Walter Johnson & Hippo Vaughn and 1924, Walter Johnson & Dazzy Vance. Tom mentions "Since 1935, only the 1954 Orioles had a lower HRA rate than those 1969 Mets." Tom also looks at the best months in hits allowed and strikeouts. Prior to Sept. that year, the Mets' HR rate was .023842 (using batters faced - IBBs - SH). In Sept. it was .002841. So the Sept. rate was only about 1/8 of what it had been before that year. The probability of getting 3 or fewer HRs was about 1 in 36 million (I welcome any comments or corrections on this). Just cutting the HR rate in half or less that month (about 13 HRs allowed) has chance of only 1 in 183. 6 HRs or less is 1 in 225,000. The Mets did allow 3 HRs in the last two days of the season in Oct. But by then they had clinched the division. They allowed no HRs from Aug. 30 to Sept. 18 in a total of 22 games (that is what a quick check of Retrosheet shows). On Sept. 19, game 2, Stargell of Pit. hit a 2-run shot in an 8-0 Pirate victory. But by then, the Mets already had a 5 game lead with 13 games to play (the Cubs had 11 left). On Sept. 21, game 2, Stargell hit a solo shot in the 4th inning to make it 4-1 but the Mets won 6-1. It seems like none of these HRs was significant. Only one even had a man on. The Mets also allowed only about 31% of their HRs for the whole year with runners on while the rest of the league was about 43%. The Mets turned 30 DPs in Sept. Their next highest month was 25 and the next after that was 18. Don Cardwell had an ERA under 1.00 in Sept. It was .039 in 23 IP. It was 3.25 going into Sept. The table below shows some basic stats for each month in both leagues. Hard to sum up September so far. The AL so far has had a big drop in OPS but runs per game is up. The NL is about the same as it was in August. Can Justin Verlander Win The Pitching Triple Crown? He now leads the AL in wins, strikeouts and ERA. Weaver has seen his ERA rise quite a bit over his last two starts. After Aug. 24, Weaver's ERA was 2.03. He gave up 13 earned runs (ER) in 11 IP over those two starts. In fact, after his Aug. 5 shutout of Seattle, his ERA was 1.78. For all of August, his ERA was 4.28. He also gave up 8 ER in 4.2 IP against the Blue Jays on Aug. 13. Before the All-Star break his ERA was 1.86. Since then it has been 3.82. Verlander seems to have been a little more steady. His ERA before the All-Star break was 2.15. Since then it is 2.75. Since June 15, his ERA has been no lower than 2.15 and no higher than 2.38. Verlander has only once given up more than 4 ER (a 6 ER game) and has always pitched at least 6 innings in every start. He has only given up 4 ER 3 times and has not given up exactly 5 runs even once. 22 of his 30 starts had both 3 ER or less and 7 IP or more. 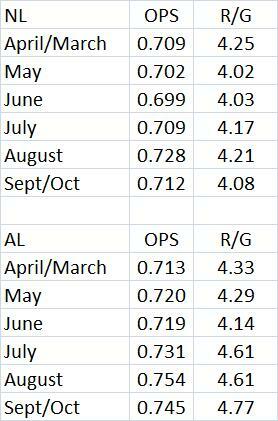 So far this year, the AL is averaging 4.41 runs per game with an AVG-OBP-SLG of .257-.322-.405 and an OPS of .727. 1992 was the last year the AL had a lower runs per game with 4.32. Same for OPS, .713. 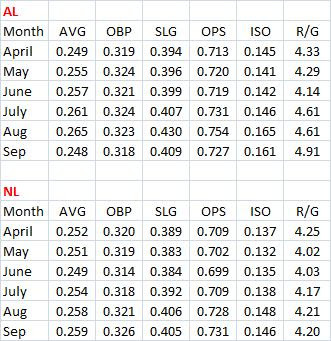 Last year the AL R/G and OPS were 4.45 and .734. So not too big of a drop off. Of course, things can change with Sept. So far this year, the NL is averaging 4.15 runs per game with an AVG-OBP-SLG of .253-.319-.392 and an OPS of .710. The last time the NL had a runs per game lower was in 1992 at 3.88. That was also the last time they had a lower OPS, at .684. Last year the NL R/G and OPS were 4.33 and .723. The table below shows how each league has done, month-by-month, this year. April includes March data. Both leagues had their best power month measured by SLG and ISO.